Got good sleep. Went to church. We had a good lesson on Mosian 18-20. The people of Limhi were outnumbered by a large group of the Lamanites that had enslaved them. They were originally conquered by the Lamanites when they fell into sin under king Noah which resulted in a loss of morale of their army, weakening it to the point where they could not defend themselves. Three times they tried to free themselves with their own strength without relying on God, and three times they were severely defeated. Finally they decided to humble themselves, repent of their sins, and come before God in prayer and fasting. When they did God showed them a solution, which was to escape and head towards a larger group of the Nephites while the guards of the Lamanites were drunk. I thought the story was very instructive. It is important to humble ourselves before God. Christ taught that whoseover exalteth himself shall be humbled and whosover humbleth himself shall be exalted. I have pondered last night what it means exactly to be humble, and especially as it applies to running a marathon. Suppose you are fit to run 2:40. If you apply the virtue of humility you go through the first half in 1:20. 1:15 errs on the side of overconfidence, while 1:25 errs on the side of self-deprecation. Both are not an expression of true humility. I would define humily as being in tune with the truth and acting accordingly. The ability to be humble in this sense is key to success in a distanace race, especially the marathon. Another thing that impressed me was that when the people of Limhi were out of tune with the truth they attempted a brainless impluslive brute force solution which did not work. Three times! When they humbled themselves, they were finally ready for the solution that would work. Earlier they were too proud to even think about it. I saw a lot of parallels with my own life experiences in that story. A.M. Started the morning with 8 in 1:03:27 with Daniel, and Jeff. Hyrum joined us for the first 2, Tyler stayed with us for the first 3.5, then his ankle started hurting and he turned around. Did 500 in 2:03 to catch up after a VPB. Afterwards drove to American Fork to pace the kids in the Harrington Memorial race. Jeff came along with us to help with the pacing job. First I paced Jenny through a 7:09 mile, a new PR by 10 seconds. Jeff paced Julia through a 9:23 mile. Julia decided to take it easy today, was chatting as she went along. She is still little, once in a while she gets goofy. Josh McAdams won the mile in 4:12. As soon as we finished, I dashed back to the 5 K start to try to catch as much distance with Benjamin as possible. I only missed about the first quarter or so. Benjamin ran great, kidded a lot of adults, was untouchable by anybody his age, taught the hill by the cemetery a lesson, that same hill that humbled him two years ago. His first mile (downhill) was 6:33, then 7:19 uphill, and third downhill mile in 6:41. He finished in 21:12, a new PR by 20 seconds. He almost outkicked a high-school age teenager on the last quarter with his Lasse Viren style kick. The only problem was that his legs are not yet quite Lasse Viren's length. But still, 21:12 is very decent for a 9 year old kid. Ran some more miles with Jeff afterwards. Seth Wold ran 15:29 for second, with Dustin Bybee a few seconds ahead. P.M. 3.5 pushing Julia in the stroller in 27:52. A.M. Ran with Jeff, Josse, and Daniel. Matt joined us on the trail later. Dropped Josse and Daniel off at 8. Dropped Matt off at 10, and Jeff at 12. Ran some more. Ended up with 15.17 in 1:53:31. P.M. Had Jacob and Joseph in the stroller the entire run. Took Julia for a mile in 9:58, then did the swing run. Benjamin ran 2 in 15:41 while Jenny rode a long, then we played at the swing, and Jenny 1.5 in 13:16 while Benjamin rode along. A funny thing happened. A procession of a dad in Five Fingers pushing two kids in a very beat up stroller accompanied by a 9 year old boy on an old undersized bike and a 7 year old girl in Crocs was advancing at about 8:45 pace along the trail. We passed a young running couple. Both looked fit. He says, "what, you are passing us with two kids? ", and then he sees that there a little girl passing them as well and she is on foot! Five Fingers - 145.33 miles. A.M. Started with Hyrum, Jeff, and Daniel. Hyrum ran the warm-up with us then ran back to the house. Paced Daniel through a 5 mile tempo. The plan was to see if he could handle 6:00 pace, and then see how easy it was by picking up at the end. Mile splits were 6:00, 5:58, then we had 14:57 at the turnaround, third mile was 5:57, then 5:51, and 5:47 on the last mile which had some uphill. Total time 29:33, last 2.5 in 14:36. Very decent, he is starting to get in shape. Makes Daniel a good substitute for the Wasatch Back in case we need one except his wife is due on June 16th. Matt was out on the trail and joined us for some sections of the tempo. Dropped Daniel off at 9, ran another 1.05 with Jeff, and then finished 15 alone. P.M. 0.7 alone, 1 with Julia in 9:47, 1.5 with Jenny in 13:19, 2.1 with Benjamin in 17:24. A.M. 15.6 in 2:06:43. Started with Jeff and Daniel. Matt joined us in the middle. Dropped each training partner off eventually, then ran a bit by myself, and then found Derek Davis and ran with him a bit, then more alone. Miscalculated the turnaround and ended up with extra distance. The subject of discussion today was Quality X. We concluded that a good portion of it is built during the time in the womb and early childhood. P.M. 0.7 alone in 5:46, then 1 with Julia in 10:00, 1.5 with Jenny in 13:21, and 2 with Benjamin in 15:27. Went to a missionary training meeting. Half of the audience was Caucasian, but it was conducted in Spanish. Five Fingers - 186.43 miles. A.M. Ran with Jeff, Daniel, and Matt. Jeff ran 10, Daniel 8, Matt ran 10 as well but he started from his house and we found him later. So I ran the last 5 miles alone. Total time was 1:54:31. Matt at one point wondered if VPB was a special running term he did not know and he even Googled it. He thought maybe it was some kind of a speed workout. It sure is if your training partners do not wait for you. So I did my VPB speed workout today, about 0.4 at 5:40 pace. Interestingly enough, a search for VPB on Google finds my blog, but does not find the definition. So maybe if I define it again we could improve the relevancy of the search and help those who are confused. Definition: VPB = Virtual Private Bathroom, or in other words a bush. It does not stand for Virtual Potty Break, the break is very real, it is the privacy that is virtual. P.M. 1 mile with Julia in 9:46, 1.5 with Jenny in 13:17, 2 with Benjamin in 16:35, 0.7 alone. Five Fingers - 206.63 miles. A.M. Ran the Bridal Veil 10 K, 2nd place in 34:25. Jeff and I were timing the race, so we ran it as well as part of our Saturday workout. We warmed up a bit over 4 miles. It was windy, the wind was blowing out of the Provo Canyon, which meant head wind for the first 3+ miles. We did a couple of strides to gage the wind. On the first one we ran 43 seconds for 200 uphill into a headwind. On the second one we ran 37 downhill with a tailwind. Got to the start, found some competition. Bryan Summers, a coach at West Jordan High, 4:35 miler, winner of the Salt Lake 5 K this year (16:31), one of the 4 runners who saved the male field from being chicked by Emily Jameson. 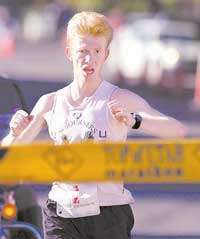 He was wearing the Wasatch Running Center uniform, my former sponsor, to make things more interesting. To better deal with the wind Jeff and I decided to stick together in the first 3 miles trading leads at 1 minute intervals or more often if necessary. So I would push the top end of how fast I was willing to start, while he would push the bottom end of how slow. This meant that I was having a bad day, Jeff could end up 10 seconds slower that he should have from starting too slow, and if Jeff was having a good day I would end up 10 seconds slower from starting too fast. But that was OK, since this was a low profile race with no prize money. And in any case, the cooperation against the wind would wipe out the losses anyway, so it was all good. We did everything according to the plan. Official mile markers were not exceptionally accurate, but not too bad either. I ran that race a year ago, and it came out 6.21 on my GPS as well as on Ted's. I did not wear a GPS this time, and was going off the official mile markers as well as the triangles on the trail to double check on occasion. First mile was officially 5:41, second 5:59. Brian was still with us. He sat behind the first 1.8 miles, and then moved up. That was good, I did not have to take my turn, nor did Jeff. At around 2.2 Bryan was done leading, and Jeff moved up, but the wind was so strong he asked me to help. So I moved up, did what I could, then Jeff took over again. As Jeff turned up the heat, I started moaning, and we dropped Bryan. The wind died down a bit, so Jeff was OK putting more fuel into the fire while running up front. Our third mile was 6:13, but it was probably long. We did hit bad gusts, but they were not any worse than in the second mile, and the climb was about the same level of steepness. Shortly after 3 we hit the turnaround. I moved up for a little bit, but then Jeff took over again and now was going full steam. Things started getting miserable for me, but I wanted to be with Jeff for as long as possible, because I knew that once I was left alone I would not have the drive to push. We hit the next "mile" in 4:51, which was definitely short, probably by the same amount as the third mile was long. Shortly after 4 I lost concentration and Jeff was gone. From then on I ran in survival mode, but it was still decent. Next mile was 5:18, which was probably right (and it agreed with the triangles), followed by 5:23 that was long, and 1:00 to the finish, which was definitely short as I was not kicking that hard. I ended up beating my last year time by 1:10, which I was pleased with. Some of it came from working with Jeff, but I think some of it came from being in better shape. Jeff won with 33:46, Bryan was third with 36:28. We timed the race, and then went to run the rest of the miles. Ran another 7.6, found Bryan shortly after we started, and he joined us. We did a fair share of FRB propaganda on him, hopefully it will bear fruit. Total of 18 miles for the run. P.M. 1 with Julia in regular walking shoes in 9:32, then 2 with Benjamin in Five Fingers in 17:18 with Jenny doing the first 1.5 with us in 13:15.